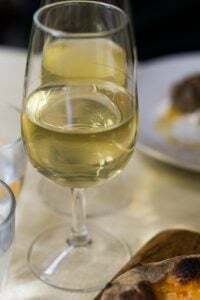 I was in the middle of a lovely spring lunch at Chez Prune up by the Canal St. Martin the other day with Paule Caillat, a friend who teaches cooking classes here in Paris. We talked about many things, but of course, the conversation quickly turned to the most important subject of them all: baking. And soon she began to tell me about this tart dough recipe that she’s been making for years. I was expecting her to say, “You begin by taking some cold butter and work it into the flour. But she started by saying, “You take butter. And you take water. You put them in a bowl. Then you put it in the oven for 20 minutes and let everything boil until…” which, of course, stopped me mid-swallow of my Côte du Rhone. I almost started choking. “Surely, you jest!” I wanted to cry out in disbelief. Except I couldn’t, because I don’t know how to say that in French. So I just sat there with my mouth agape, which is a pretty uncharacteristic position for me to find myself in. Then she reiterated, that she heated the butter in the oven and dumped in some flour then stirred it until it was smooth. Seriously gang, you coulda knocked me over with un plume. It was as if someone told me that I had packed up and split to a foreign country with no plans for my future. It was all just crazy-talk. So Paule invited me to her beautiful kitchen where she teaches cooking classes at Promenades Gourmandes, to make the dough. After I caught my breath at her kitchen, which was roughly the size of my apartment, she lit the oven and soon the butter was bubbling merrily away in the oven. She made me come over and look, showing me how it was darkening just around the edges, “comme le beurre noisette”—like browned butter. Immediately my breathing became short and I had to brace myself against the wall (although a slug of Côte du Rhone brought me back): I knew that you’d flip out if I didn’t get an exact amount of flour out of her. Yet after multiple messages back and forth with her from my home kitchen, I came up with the right quantity. I know from experience pinning down the French isn’t always easy, but the rewards are invariably worth it. If you’ve been afraid to make tart dough, give this one a try. It couldn’t be easier to make, or more interesting, and yielded a wonderfully flaky, buttery dough. And if anyone asks for the recipe, do make sure they’re not mid-gulp. Adapted from a recipe by Paule Caillat of Promenades GourmandsIn France, I used type 65 organic flour, which is similar to American all-purpose flour. 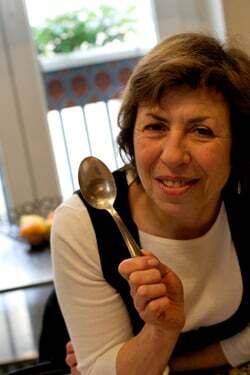 Paule says that her students report back, saying that the dough works beautifully with American butter, too. Small cracks in the dough are normal so I wouldn’t use this for a thin, custardy filling, although it works well filled with chocolate ganache and I would imagine it would be lovely filled with fresh berries resting on a base of pastry cream.Do be careful with the hot bowl of butter. Not only will the butter spatter a bit when you add the flour, but it’s uncommon to have a very hot bowl on the counter and easy to simply give in the urge to grab it with your bare hands. Preheat the oven to 410º F (210º C). 1. 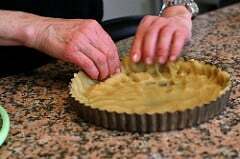 In a medium-sized ovenproof bowl, such as a Pyrex bowl, combine the butter, oil, water, sugar, and salt. 2. Place the bowl in the oven until the butter is bubbling and starts to brown just around the edges. 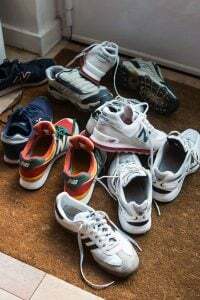 It may take up to 15 minutes, but check before. 3. 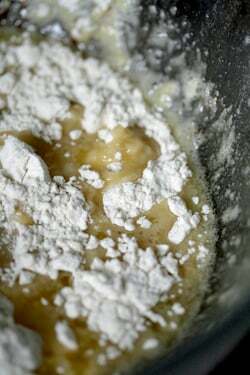 When done, remove the bowl from oven (and be careful, since the bowl will be hot and the mixture might sputter a bit), dump in the flour and stir it in quickly, until it comes together and forms a ball which pulls away from the sides of the bowl. 4. 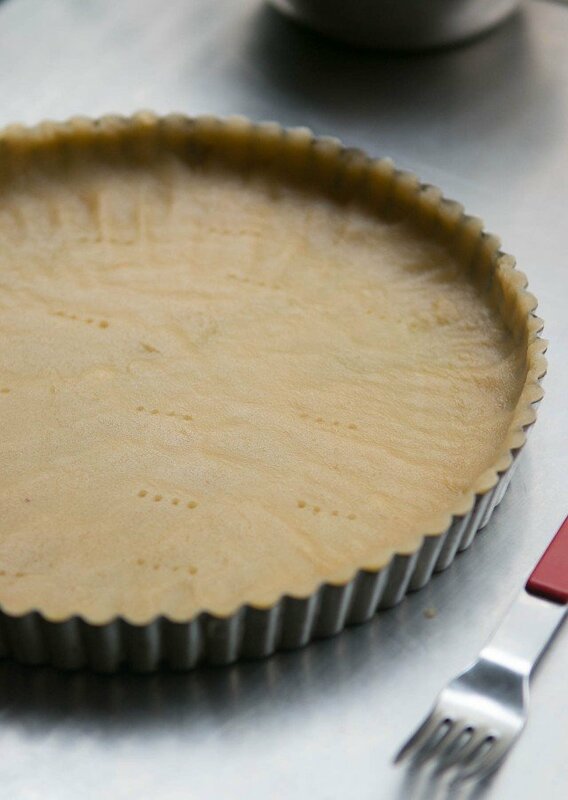 Transfer the dough to a 9-inch (23 cm) tart mold with a removable bottom and spread it a bit with a spatula. 5. 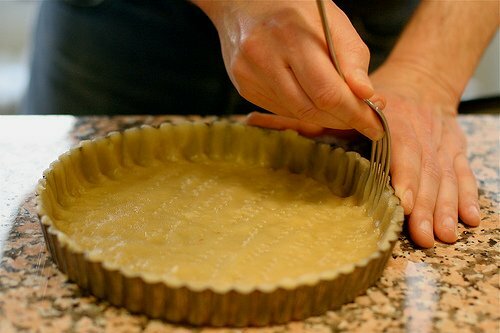 Once the dough is cool enough to handle, pat it into the shell with the heel of your hand, and use your fingers to press it up the sides of the tart mold. Reserve a small piece of dough, about the size of a raspberry, for patching any cracks. 6. 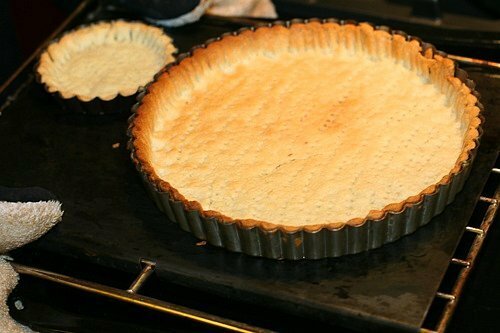 Prick the dough all over with the tines of a fork about ten times, then bake the tart shell in the oven for 15 minutes, or until the dough is golden brown. 7. Remove from the oven and if there are any sizable cracks, use the bits of reserved dough to fill in and patch them. I find it best to pinch off a small amount of the reserved dough, roll it gently between your fingers to soften it, then wedge it into the cracks, smoothing it gently with your pinky. 8. Let the shell cool before filling. As a professional baker I am dying to try this. Will do so today. I wonder how this scales up. Will let you know when I try. Also appreciated the comments about using it for the cheesecake crust. One question – does the shell get soggy if filled and refrigerated. I’m afraid you eat it too fast to know. But if you do, please let me know. Thanks – am excited I found you – even though I may be the last baker to do so. I followed the recipe exactly, but my tart base rose, forming something like a dome. Why is this happening? I pricked the dough all over with tines of a fork, like the recipe says. Please help! I just tried this recipe, though I was very leery in doing so. The dough was so soft that I was sure it would fall. But it is just moments from being pulled out of the oven and it is BEAUTIFUL!! Thank you!! Will keep this recipe for sure! Oh David . . . David, I LOVE YOU!!! This pastry is idiot-proof, even for hot kitchens. How can something that’s so easy, quick and good be unknown to so many people for so long? It’s mind blowing! I think we should gather all other pastry recipes in a heap and set them on fire! Help…..just made this very tasty crust but it is waaayyyy too flaky. It will not hold together. I am in Denver. Does high altitude affect this and if so, what can I add or delete to compensate? Any syggestions…. Unfortunately I’m unfamiliar with high-altitude baking and can’t offer advice about Paule’s tart dough since I don’t specialize in that. Yes!!! This is almost exactly the dough recipe my family has used for ages. We add a bit more butter, a little less water, and no oil, but the oven melting butter method is the same. 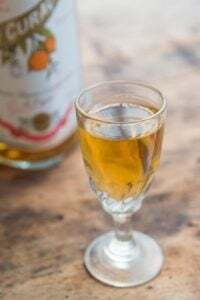 I love this with a peach tart. I’ll make sure to link this on my blog in my peach tart recipe. Thank-you so much for this recipe! I was looking around for an easy pastry for a tart I was going to make and I vaguely remembered this post. What a great sounding recipe!! Please tell us how you make the chocolate filling, it looks HEAVENLY! Gorgeous texture . PS; Just going into the kitchen to make this! 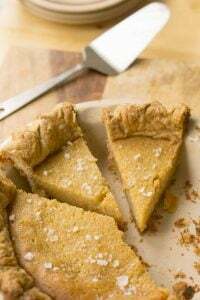 Love the flavor and texture of this beautiful pastry but I’ve made it 2 times and in both instances the tart cracked all over like a road map. 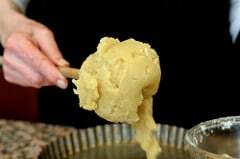 I saw above post (from Faith) about using European butter—but could all these US folks be going out and buying different butter just for this recipe? 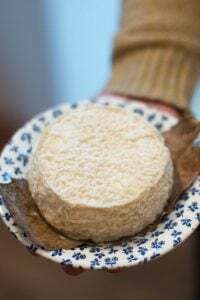 I use typical American butter here in TX; do I need to seek lovely French butter for this recipe? Thanks for any help! Since it’s not my recipe, I can’t troubleshoot it for you as I myself am unclear why and how it works. I am not sure you still read these comments, but I wanted to let you know I used this with success for a pie. It is not the easiest dough in the world to roll out, given that it is warm and soft. I had to add a little more flour than it said, but it can be done. 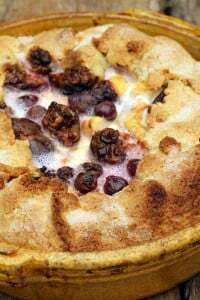 I make an excellent pie crust the traditional way, but I was making an apple pie and I wanted something a little less flaky and more tender and this really fit the bill. It ended up perfect. I didn’t blind bake, since I was making apple pie, but I just baked my pie on 350 degrees for like 45 minutes and it turned out perfect. So although it seems weird, this can double for pies. Hi David, Thanks for this. I used this for a fig tart and it turned out great! Please help! 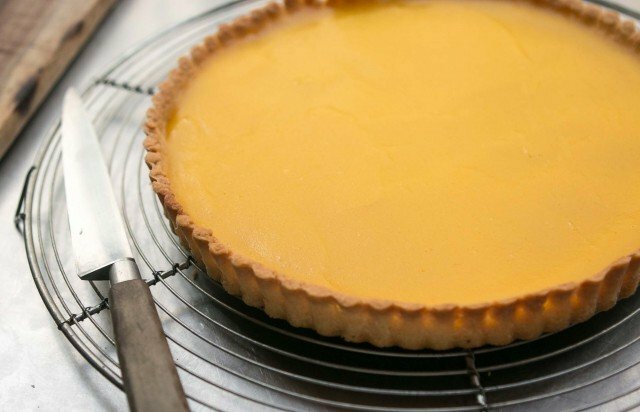 My tart shell was stuck to its fluted sides and when I removed it, the whole side piece came off and was stuck to the outer ring….Did I do somethinkg wrong – like making the sides too thin? I tried to follow the thickness shown in yor pics but obviously I am still doing something wrong. Otherwise, this is a perfect crust albeit a bit greasy. Will try to reduce the butter slightly. Also, I used superfine cake flour instead of the all purpose…does that have an effect? 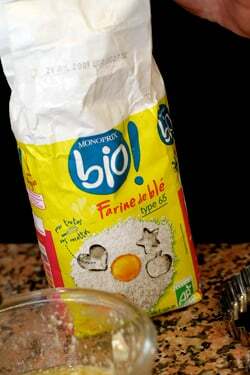 oi-ming: Superfine cake flour is not the same as regular flour due to the grind, so it will behave different when baked. For more information, read my post: Baking ingredients and substitutions. Thanks for the response. I will try the recipe again and this time with all purpose flour. I hope it will turn out alright. I will also double the amount used since some posts say that it is not sufficient for a 9″ tart pan. BTW, just wanted to let you know I finally got your book “Ready for Dessert.” I love the pics and wish there were more….I read a few pages already and plan to make the racines or choc pave soon….Thanks for the lovely recipes David!! 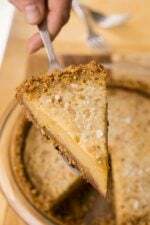 Insanely easy and delicious pie crust. Ever the skeptic, it was hard for me to fathom how it could possibly work (what, no pie weights, no rolling)! But it did…. beautifully. The pear/almond tart (your recipe) was eaten down to the last crumb. This would be a great base for caramelized onions with a sprinkling of gruyére, and other savory fillings as well as sweet. I used King Arthur all-purpose flour, unsalted butter, canola oil… ingredients all readily available in the U.S.
May I say this was amazing. 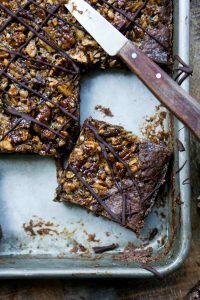 I have stared at this recipe and the photos since I found the recipe last night; doubting that it would come out with the texture, taste and flake of a traditional method and recipe. I am making small fruit tarts with a traditional pastry cream and wanted them to come out right. The pastry dough was so ridiculously easy! After baking them I allowed them to cool completely in the pans. They removed easily, no breakage. They taste fantastic; I cooked the little bit leftover so I could try it before assembling and taking to dinner tomorrow. I did have a slight issue remembering the bowl was HOT, after I pressed pastry into each pan I forgot and grabbed the bowl to get more dough for the next pan. Idiot moment(s). Is it possible to use this recipe substituting whole wheat pastry flour in place of all-purpose flour, or will the product be compromised? 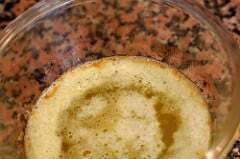 Are regular pastry and cake flours acceptable substitutions? Also, is a pyrex bowl necessary to melt the ingredients, or can a pyrex pan be used instead? (I ask because I do not have an oven-proof bowl on hand, and I would like to avoid purchasing a new bowl.) Thanks for all your help, and for sharing this recipe! You can check my post on Baking Ingredients and Substitutions for additional information. Wow! I can’t believe how easy this is… and that the butter is boiled! 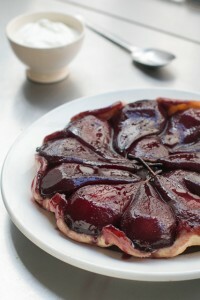 I plan to bake this when my French boyfriend comes, to impress him (hopefully); can I add jam filling to the dough before I throw it in the oven? I prefer not to have a top on my jam-filled torts, but I just wanted to double-check. I posted almost a year ago, so sad that my tarte shell shattered! Since then I’ve made it a few more times, at first with the same results, but decided to give it one more shot for my Christmas party. Fourth time is the charm I guess and it worked! All it took was a leetle bit more flour. My success was due to using a VERY rounded cup instead of a slightly rounded cup. I also dipped the cup in the flour instead of spooning it in like I usually do. And it’s really not possible to go overboard with filling in the cracks. I almost broke one of my shells, being clumsy when taking it out of the oven, but patched up about ten huge cracks with the reserved dough and that made it sturdy and good as new! Thank you for this go to recipe that makes it so so easy to make an elegant dessert any time! Hello, David! I’ve had two disastrous experiences trying to make pie/tart crusts in the past…and then I came upon this recipe. I truly wish I hadn’t, because, the results are STUNNING and delicious…buttery, flaky, light, and truly EASY. It took me 20 minutes to make a frangipane-filled, apple slice-topped tart…that’s including the frangipane making. 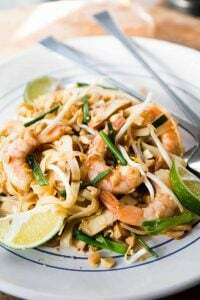 I wish I had never found this recipe, since now I am going to be using it every time, and there goes my waistline!!! Thank you very much. I admire your website and your prowess!! I used this recipe for your pear/almond tart at Thanksgiving and the raves are still coming in! The one thing that was interesting…when I was baking the tart with the filling, I’m glad I put the tart on a baking sheet since alot of melted butter ran out. It is probably due to the higher water content of American butter, but besides switching butters, any suggestions? It didn’t take away from the flavor or texture of the finished product. Really interesting recipe! I can’t wait to try it. I have one question though, if a recipe does not require the tart shell to be par-baked, would Paule’s recipe work without par-baking? 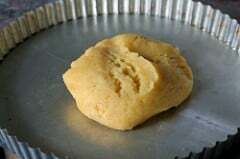 Am baking this one , and baby itssss ssooooo wonderful gorgeously delighting!! Will put up the post asap and leave the link! Bom fim de semana com amor. This is amazing! I love this, you all, you really have to try this if you have not yet tried it. So freaking easy! And delicious, lovely with lemon&lime filling.